Picture an extremely crowded restaurant. Tables are lined up without room to spare, leaving the smallest paths to pass. Now imagine running a few minutes late to meet a blind date. You enter this restaurant and see him at a faraway table. The goal, of course, is to make it to that table in a nonchalant yet confident manner. Sounds easy enough, right? In the episode titled “Crowded,” from season one of “My Gimpy Life,” Teal is this woman at the restaurant. The star of the web sitcom doesn’t want to stand out, however she must ask most of the restaurant diners to move their chairs so that she can get through…with her wheelchair. Can you relate? I know I can! While watching this episode last year, I nodded and laughed at this and many other awkward scenarios Teal found herself in, and my reaction continued throughout the remainder of the season. Brent and Teal in season two episode "The Morning After"
While “My Gimpy Life” is currently in its second season, Teal and Gabe started working on the show in late 2010 when they filmed the pilot episode. Steven Dengler, co-founder of the currency site XE.com who financially supports indie projects through his investment company Dracogen, saw the pilot. He believed in Teal and her “dream project” and funded the first season. After that season ended, fans clamored for another round. When “My Gimpy Life” had trouble finding funding to do more episodes, it was their Executive Producer Steven Dengler who suggested they look at crowdfunding. Fans around the world raised almost $60,000 in a Kickstarter campaign to get season two into production. Through that campaign “My Gimpy Life” found another great partner in Russell Winkelaar, who along with Steven Dengler, is a Season 2 Executive Producer. Teal and Teale reunite in the episode titled "Also, Teal Too"
Indeed Teal has staked her claim in the acting world. In 2004 she was cast in HBO’s Emmy Award-winning “Warm Springs” starring Kenneth Branagh. She also appeared on stage with Dustin Hoffman, James Cromwell, Annette Bening, and Richard Schiff in “American Voices” at the Broad Theater in Santa Monica. 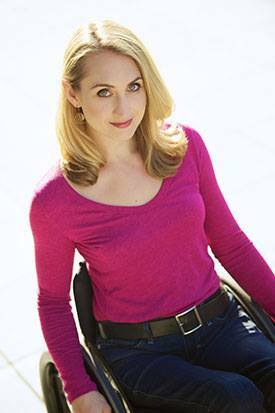 In addition, Teal produced and starred in the Pulitzer Prize winning play “Proof,” as the first person with a disability to play the lead role of Catherine. These credits are merely a few from Teal’s impressive list of professional accomplishments. You can watch the first three episodes of Season Two on the “My Gimpy Life” YouTube Channel, and the season finale will be out later this week. And if you need to catch up on Season One, you’ll find that on their channel as well: youtube.com/MyGimpyLife. For more information and to follow the series, visit Facebook and like “My Gimpy Life” and check out www.mygimpylife.com. For more about Teal Sherer, visit www.TealSherer.com. Updated note: "My Gimpy Life" lands on Facebook October 1st (with captioning, of course). For more information, visit www.facebook.com/MyGimpyLife?fref=ts. After the completion of your study, the next step is to get good job opportunity which completely depend upon your writing skills. If you don't know about writing effective job letter or application then get simply amazing research paper writing service to get written your papers as well as for some helpful tips. Looks like a great time and certainly brought back some fun memories!. Glad you enjoyed it too.